seems like the roster is mostly complete. main questions left are if they're going to sign another veteran backup catcher or call caratini up, and if they're going to sign more outfield help. right now it would be heyward (who has been mediocre at the plate), schwarber (who has been mediocre in the outfield) and a platoon of happ and almora. i'd be fine with them re-signing jay, who was solid last year, to have another option. With the roster re configuring, I think they look better going into 2018 than they did in 2017. Bullpen looks to have more depth and you got to figure that some of the hitting hangover they had starting last year might not happen again. i'm pretty optimistic about this season vs last. i'm not sold on Yu making it through the whole season intact but i like the rest of the staff, and I'm a bit bullish on Schwarber bc his second half performance was pretty damn good. not related but his home/road splits last season looked like a Rockies player, if he can bring up his road numbers a bit it'll help him out considerably. Heyward hasn't been very good but if he can continue to be a superior defensive player and just be passable enough offensively it'll be good news. the less i see of a 6'5" 240 dude grounding out weakly to second the better though. Bryant was excellent last season but a bit down from the previous year...I imagine he'll be better this year, he was also better in the second half and curiously a lot better on the road. i didn't even know about him. what's his deal? his AAA stats look amazing, especially for a catcher: .342/.393/.558, and another solid year in AA the year before that. but he's not on the top 100 prospect lists anywhere? Crazy thing was that it seemed like they had a bad or at least off year and still won the division. They would need to carry three catchers, which depending on the team isn't a bad way to go. I think clubs keeping a 11-12 guys in the pitching staff cuts out a bench position. Teams seem to often carry that extra pitcher, just in case. Do that, you really can't use your backup catcher in the same way off the bench. i thought Happ last year was really impressive, even just as an unflappable-seeming guy who happens to look like a young, vv serious Dexter Fletcher. WGN's score graphic being in the middle-top of the tv frame is super wrong. What else is a widescreen tv for if not to have sports graphics in an unobtrusive corner? It's the kind of mark no offense wants to set, but nonetheless, after the Chicago Cubs struck out 11 times in a 1-0 loss to the Cincinnati Reds on Monday afternoon, the 2016 World Series winners have now whiffed the most times -- 58 -- of any NL team ever through its first five games. The Cubs are just 1-for-14 so far bringing a runner home from third base with less than two outs. That's by far the worst percentage in baseball for any team with five or more opportunities in that situation. Baez taking a ball off his unhelmeted noggin is a tough way to get a tying run. and now maddon sends up jon lester to pinch hit? Why is Baez batting 2nd for #Cubs? Maddon: "I wanted him to get that energy at the top. ... There's nothing brilliant about [the decision] whatsoever"
they only scored 9 runs across the four-year game brewers series and still managed to sweep. seems like things just aren't clicking yet - they haven't had many games where the pitching and offense both performed well at the same time. they had some strong offensive games early on but the pitching was struggling, then the pitching tightened up but the offense went cold, then nothing really went well against the cardinals. rizzo is still having problems, javier finally cooled off, etc. i try to remember that they were basically a .500 team through the all-star break last year too before heating up in the second half. The pre-championship season they were basically .500 at the break too iirc. I think 2016 has been the only recent year where they were wire-to-wire great. That seemed to be a huge homer call to not give Heyward an error yesterday. Something happened to Baez too. Couldn't tell what but he limped off with a trainer. Schwarber can still be shaky in the outfield but he's got a good arm. there was just a fangraphs story today suggesting he was heading for regression. he's been walking tons of batters all season but has been lucky with the results so far. this is fantasy-focused but i'm glad it confirms my suspicion that schwarber is quietly improving, even if he isn't slugging homers all over the place. he's obviously emphasizing patience/plate discipline and becoming more of an on-base guy than a slugger, which i believe was his projection before he was called up. Tyler Chatwood gives out more free passes than a cheap gym franchise. just over .500 since the all-star break despite series against the padres and royals, fortunately the brewers have kept the same pace. second walk-off slam this season for them iirc, first walk-off slam by anyone with their team down to their final out and down 3 runs since 2011.
hamels is looking like a great pick-up so far: over 18 innings with the cubs, he has 1.00 era and 20 Ks, with no homers. obviously unsustainable but still promising. Lester needs rest that he's not going to get. Not sure why there's so much confidence in Justin Wilson as a reliever, but we got what we got. Sure glad that Strop has stepped up this year - he's fun to watch. I think the big question, is who gets sent down. I vote Russell and put Baez at Short and Bote on Second Base, when Bryant returns. russell is def the one guy who i don't have much confidence in when he steps up to bat. he's great defensively though. One of the hardest games I ever sat through - can't bring myself to look at scorecard again. Best quote I saw on reddit's /r/ChiCubs channel: Worth remembering that Quintana's affordable contract was a big selling point. That financial freedom allowed them to acquire both Chatwood and Darvish. I have a pretty big oven if anyone's head wants to join mine in it. Oh just saw the news. i mean that's a great offensive lineup but also they had one run in each of their last four games so ??? Rizzo has been more or less struggling all season, Bryant is injured, Heyward is Heyward, Happ and Almora have wrc+ of 100, sure it's a very good lineup but a four game funk can happen to even better lineups. Was Hendricks ever good or was that just my imagination. cubs rotation ... is good now?? It says something to the Cubs depth of roster talent how well they have played the last two seasons with people having off years and quite a few injuries. You might figure a couple of those guys would be in their top 5. Zobrist has had a nice bounce back year. i was at the game last night. i think i'm good luck for lester - he had the 2-run single off of syndergaard, picked a guy off at first, and made a great snag of a hard hit. last time i saw him pitch he hit his first career home run. 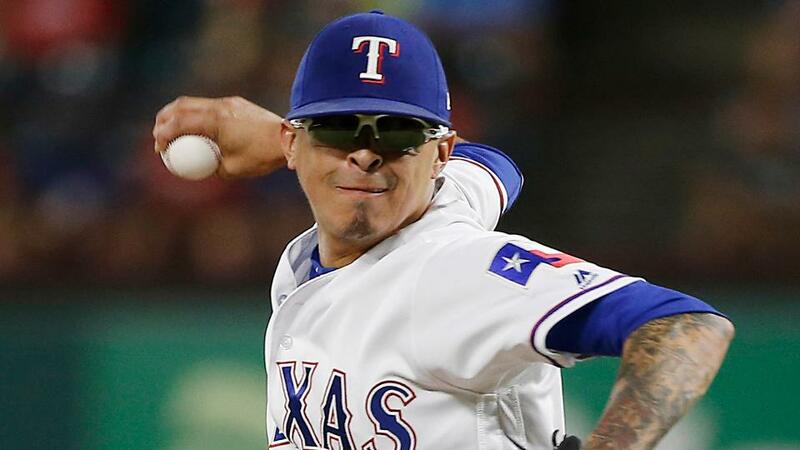 Jesse Chavez pitches in prescription sunglasses, even in night games. Who knew. he lives near me, so about 2 miles from wrigley (unless he's moved in the past couple of years). biking makes sense. “Major League Baseball takes all allegations of Domestic Violence seriously. When the allegations against Addison Russell became public on June 7, 2017, the Commissioner’s Office’s Department of Investigations immediately commenced an investigation. Melisa Russell declined to participate in the investigation at that time. Our investigation of this matter has remained open and we have continued our efforts to gather information. "This is b/t her and Addison. ... I'm not gonna be swayed one way or the other by reading this. ... I'm interested in the investigation finalizing itself. ... Anyone can write what they want with social media these days." The feeling when 40 days of rest from work is the worst that will happen to domestic abusers. controversial? i wish, but was there ever any doubt that he'll just go back to playing and everyone will cheer him? that's how sports works, pretty much. yankees fans still love aroldis chapman (and the cubs fans before that, and pretty much any fanbase) because he throws a ball very fast.